One day at the Museum of Flight is not nearly long enough to enjoy all its wonders. 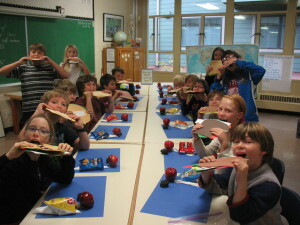 The fifth-graders and faculty left wanting more, indeed. 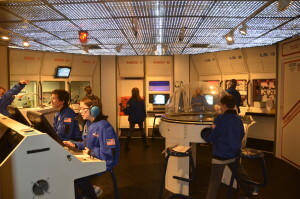 After touring the extensive collection that covers aviation history from Kitty Hawk to the Space Shuttle Trainer, Tilden’s fifth-grade students then took part in a Mars mission simulation. 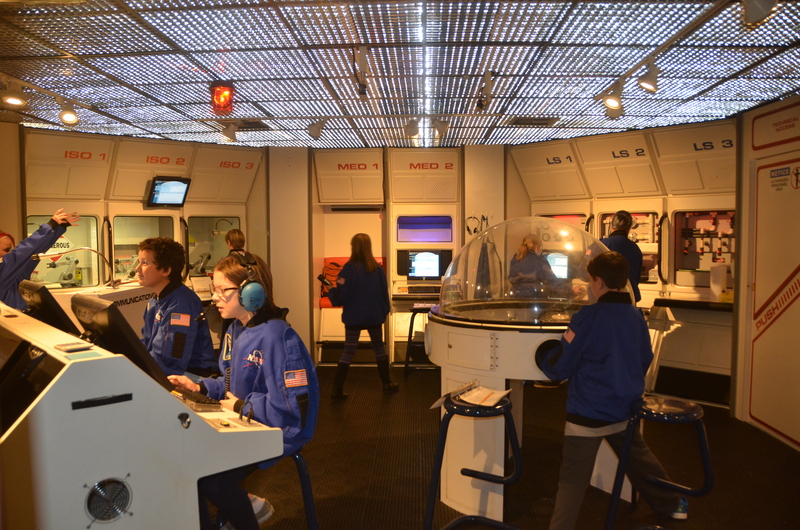 Half the class was living in a Mars space station, while the other half was traveling in a spaceship on their way to relieve the Mars crew. Students had to train for their positions, execute their missions, and troubleshoot emergencies without adult assistance. Yes, it was exciting and intense! 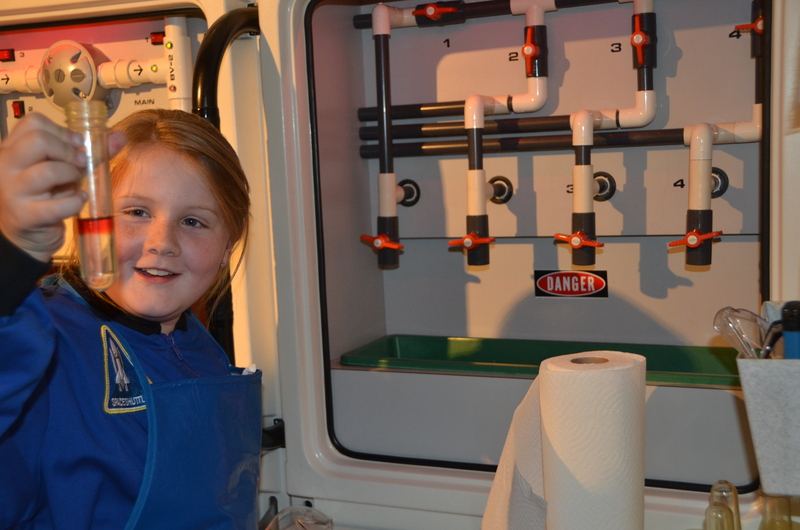 Alarms sounded as oxygen levels dropped, but then, with only 15 seconds of oxygen to go, disaster was averted–phew! High radiation readings also caused a scare, but once again, the two crews worked together, following protocol and solving the issue. And so much went well: the flight, entering atmo, the moon probes, science experiments, communication, and more. All in all, a truly awesome experience! 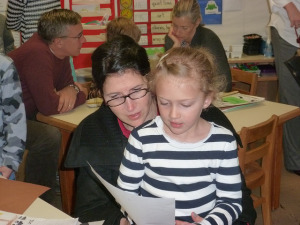 The fourth graders recently put to use the fundamental skills of researching a topic and then writing a report, and their outstanding animal reports reflect their efforts. 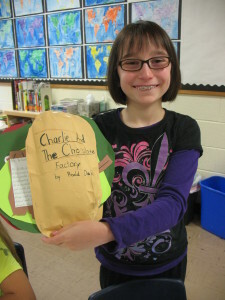 The seven-paragraph reports are accompanied by artwork, maps, and poetry, which add depth and interest to their projects. 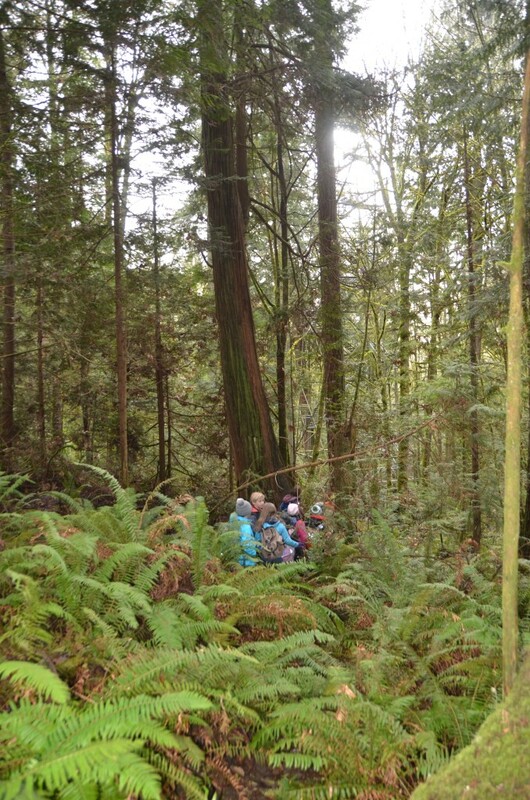 Tilden’s fifth grade class spent three days and two nights at IslandWood, an environmental sciences school in the woods on Bainbridge Island. 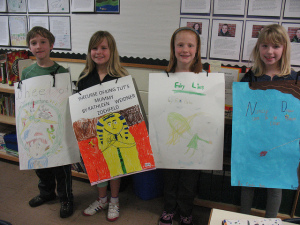 The program provides exceptional learning experiences with the goal of inspiring lifelong environmental stewardship. 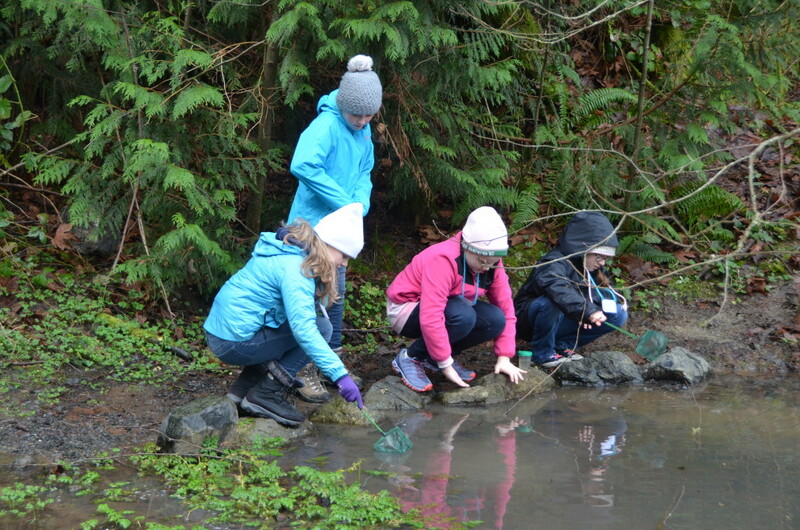 Outdoors each day, the fifth graders studied ecosystems while living in ways that are more sustainable. Now it’s up to the fifth grade students to continue living in more sustainable ways, encouraging their families and friends to do the same. 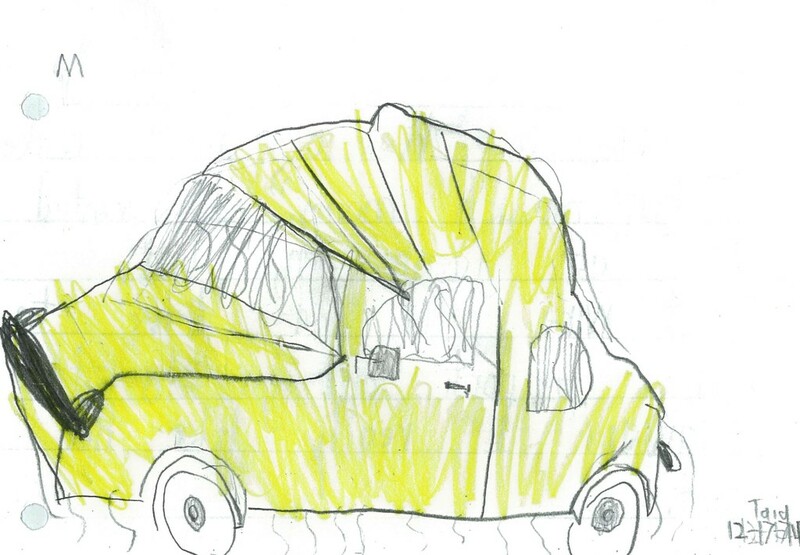 In December Tilden 2nd and 3rd graders enjoyed a field trip to Seattle Art Museum to see Pop! Departures and City Dwellers: Contemporary India. 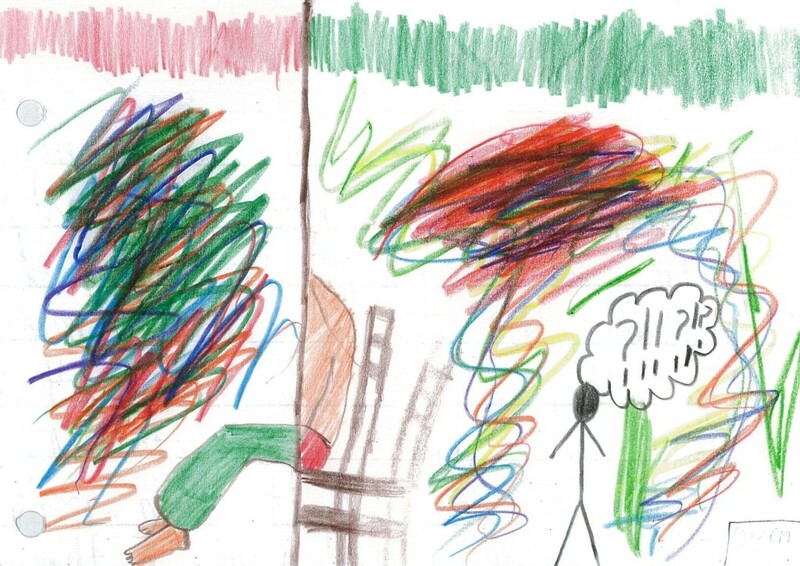 Classroom study of cubism, surrealism, and abstract expressionism enriched their understanding of early modern art and prepared them to embrace Pop! with gusto. We explored together, with plenty of opportunity for students to express their thoughtful insights and delights. 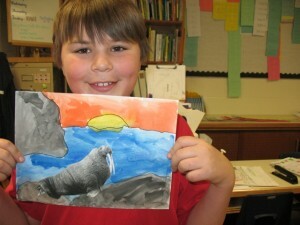 Back in the classroom, students wrote about what art they liked most. Today the Kindergarteners applied their skills of counting by 5s and tallying, to help scientists document the world’s current penguin population. 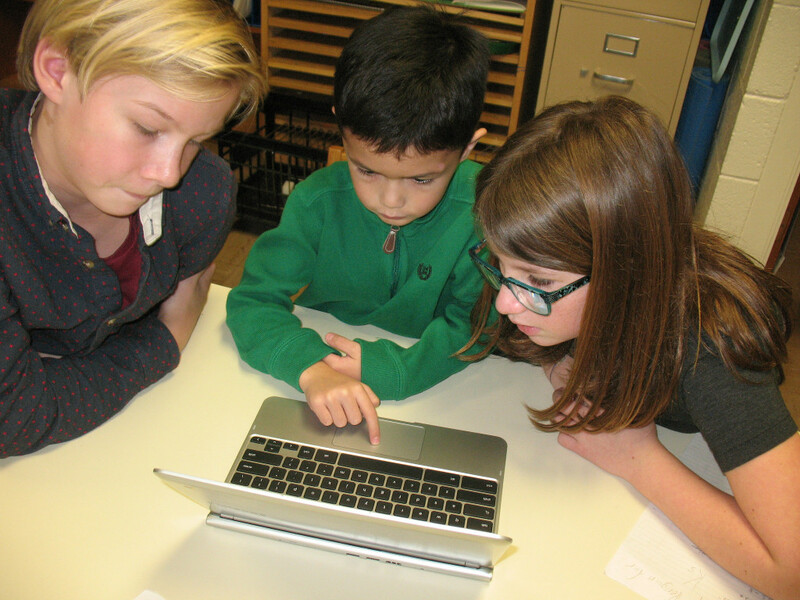 First, the fifth graders assisted their K-buddies with how to navigate the site PenguinWatch.org. Once the Ks were comfortable using the computer track pads, they were off, counting and recording penguins in photographs taken in real time. The Ks will continue to contribute data to this project throughout the month. Go, Ks! October 17, 1014: Have you eaten a good book lately? Fourth graders whipped up an appetizing array of sandwich book projects. Each “sandwich” included truly luscious ingredients, such as character and setting descriptions, story summaries, and reader recommendations. 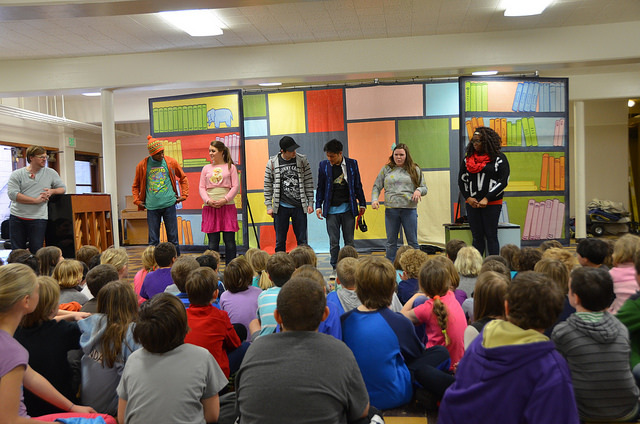 Seattle’s 5th Avenue Adventure Musical Theater performed at Tilden! While students experienced the wonder and joy of live musical theater, the performers brought to life books by authors and illustrators from the Pacific Northwest. On to the library! 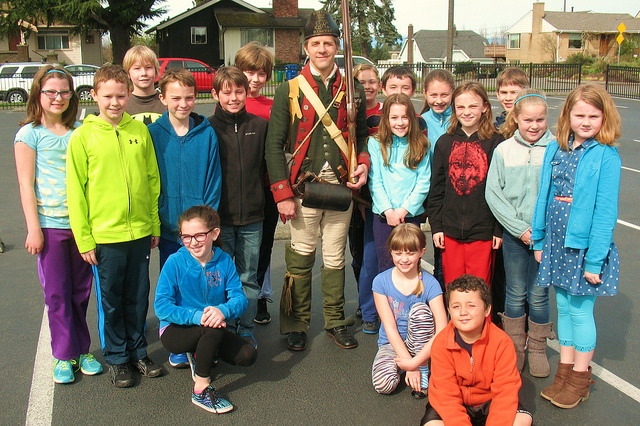 Paul Schmid, portraying a member of Butler’s Rangers, treated the 4th grade students to a colonial loyalist’s perspective on the events surrounding the American Revolution. His enthusiastic audience learned there was more than one viewpoint about the cause of independence! 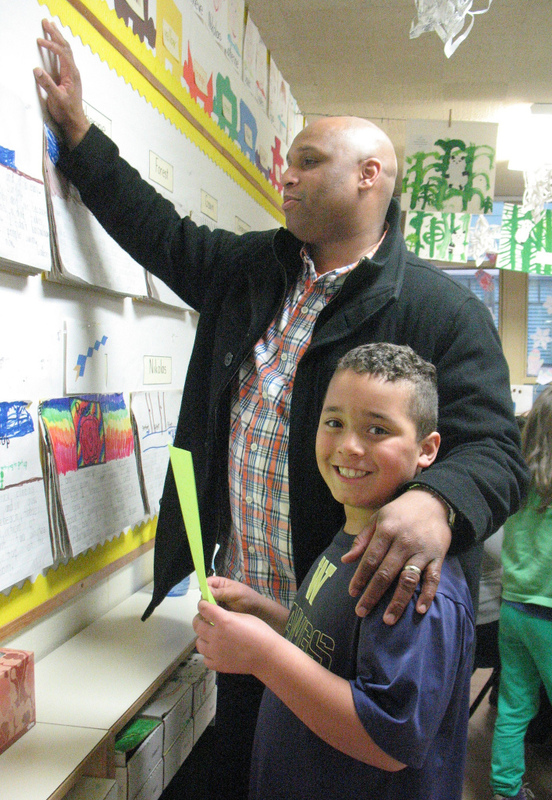 Learning is definitely cause for celebration, and the Tilden community did just that. Families enjoyed this annual event that recognizes students’ effort and achievement, beginning with time in the classrooms and halls to view students’ work, and ending with performances by each class. With all the day-to-day hard work these kids do, it was good to pause and appreciate their effort. 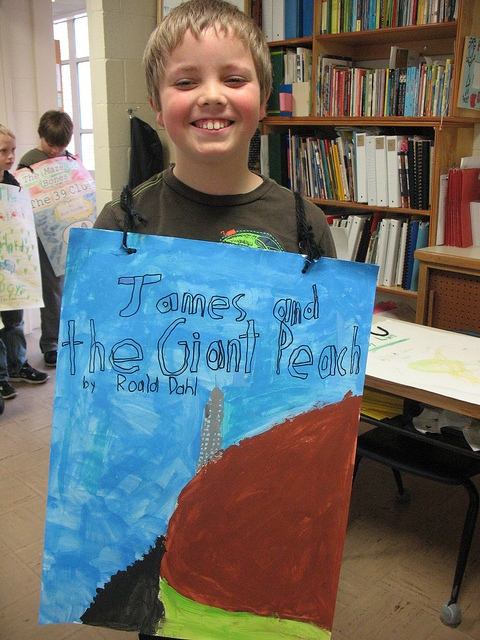 Ask the Tilden third-graders, who became books, and shared what made them great in a parade throughout the school.